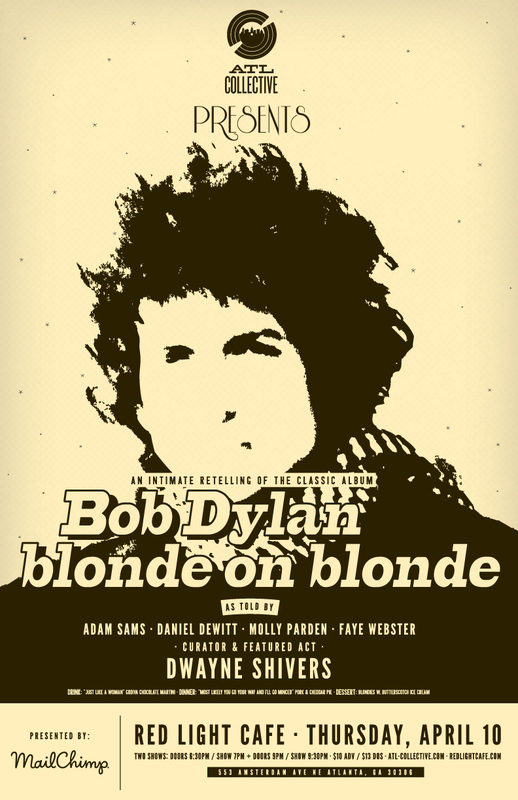 ATL Collective is taking over the Red Light Café to bring to you Bob Dylan’s Blonde on Blonde. It was released as a double album, and so we’re going to do it twice. One for each blonde. Two shows. One epic album. One unforgettable night. Our featured act and curator will be the roof-rattling Dwayne Shivers, and we’ve tapped the great Adam Sams, Daniel DeWitt, Molly Parden & Faye Webster as well to deliver the songs. The show will be brought to you by our friends over at MailChimp. The ATL Collective is a collaborative of local musicians covering a classic album from start to finish to create a night of music and storytelling. An album-themed food pairing completes the evening. They create musical events that seek to replicate the intimate experience of listening to an album for the first time, going track by track, reading through the liner notes and turning over the record, truly enjoying the music for what it is, without distractions. Each month, the ATL Collective picks a classic album and collectively covers the track list in sequence, completing the event with themed refreshments for attendees. Previous albums have included The Beatles' Abbey Road, The Clash's London Calling, Neil Young's Harvest Moon, Van Morrison's Tupelo Honey and the Beach Boys' Pet Sounds, to name a few.